In early 2017, PeopleForBikes and the Bicycle Product Suppliers Association initiated and coordinated a land manager loan program that provided Class 1 eMTBs to land managers to provide them with real-world riding experiences and help them think through how to manage them. Nearly two dozen land managers in seven states are participating in the program, from the U.S. Forest Service and the Bureau of Land Management to local agencies like the Irvine Ranch Conservancy in Southern California and Prince William County in Northern Virginia. This is the first of three blogs about these land managers and their loaner eMTBs. Read the second blog here and the third one here. As a land manager in Orange County, California, Jill Sprance, Field Operations Manager for the Irvine Ranch Conservancy, works in a place where the population is dense, with more than three million people. Not surprisingly, Jill’s preconceptions about eMTBs gravitated toward the potential for an increase in trail crowding, new trail users getting in over their heads, and potential trail impacts. “I attended a talk on eMTBs at the Professional Trail Builders Association conference in March and found it very useful. The most meaningful part for me was hearing the results of the study that showed that class 1 eMTBs had trail impacts similar to that of a traditional mountain bike” says Jill. Jill isn’t completely new to eMTBs. 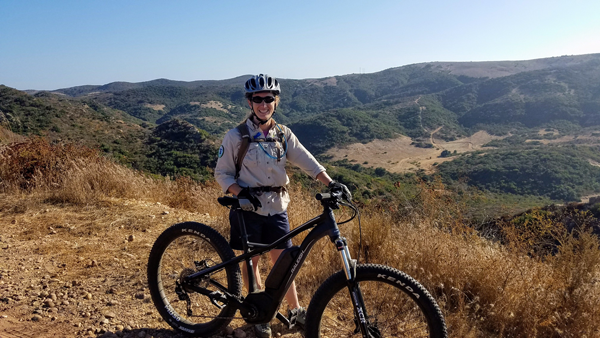 She works cooperatively with rangers from the City of Irvine Open Space, a group that has been using eMTBs to enhance their patrol operations. “The rangers are really happy with their eMTBs,” Jill explains. “They allow the patrollers to carry heavy gear, keep a low profile and catch up to more fit riders they want to contact.” In the past there was a shortage of rangers fit enough to be effective on bike patrol, but since they started using eMTBs they are able to staff more shifts because with eMTBs there are more rangers who can do the job. All told, Sprance believes that eMTBs can bring both benefits and challenges to land managers. “They offer efficiency for patrolling, hauling equipment and responding to emergencies as well as the ability to contact more trail users in a given time frame,” she says. And for people visiting their public lands for recreation, Sprance feels that eMTBs “offer accessibility of trail experiences to a wider range of physical abilities, which should produce more trail, open space and environmental advocates.” She still has some concerns, mostly with the potential for recreational users getting in over their heads, possible user conflicts and trail crowding. PeopleForBikes is making bike riding better for everyone, and e-bikes fit within that goal. E-bikes get more people riding longer. You can find resources at peopleforbikes.org/e-bikes that will help you advocate for, and find, a great ride.